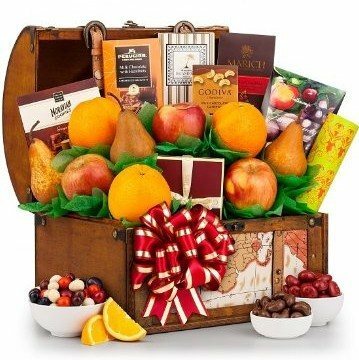 This bright and beautiful gift of hand-selected, premium fruits and gourmet items includes ripe Bosc Pears, Fuji Apples, and Navel Oranges, as well as Godiva Milk Chocolate Cashews, Candy Berries, Pistachios, and more. Each individual piece is carefully and elegantly arranged by hand in a stylish old world map-themed keepsake trunk with solid brass rivets, a sturdy latch, and intricate leather detailing. Make this special gift unforgettable with the addition of a engraved gold plaque featuring your personalized message.